Send some holiday cheer to a deployed service member. 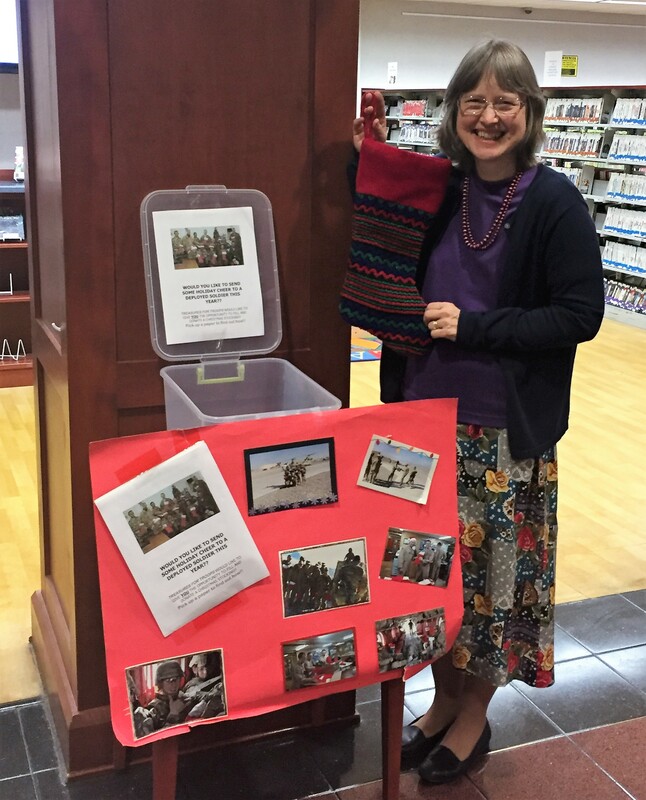 An instruction & shopping list for the “Stockings for Soldiers Drive” is available at the Warsaw Community Public Library. Filled stockings must be received by Dec. 1. Pictured is Library Director Ann Zydek. As the holidays approach, Warsaw Community Public Library offers a number of programs, both seasonal and non-seasonal, for teens and adults. Chess club meets at 10 a.m. Saturdays in December. Bring a chess game if you have one. There will be no meeting Saturday, Dec. 23. The cookbook club will host a cookie exchange at 11 a.m. Monday, Dec. 4. Anyone interested may bring six dozen cookies, divided into 12 packages. The drop in zone begins at 3:30 p.m. Wednesday, Dec. 6, featuring video games, virtual reality and snacks. Teens play until 5:30 p.m. and adults play from 5:45 p.m. to 7:45 p.m. Off the shelf reading group meets at 2 p.m. Thursday, Dec. 7, to discuss, “The Phantom of the Opera” by Gaston Leroux. The Lake City Piecemakers quilt club meets at 9:15 a.m. Friday, Dec. 8. Friends of the Library’s mini book sale runs from 10 a.m. to 1:30 p.m. Saturday, Dec. 9. Join the knit and purl club at 6 p.m. Monday, Dec. 11. The writers club meets at 6:30 p.m. Monday, Dec. 11. Write about the real story of Santa Claus, game show tales or snow globes then share with the group. Enjoy a popular holiday movie at 10 a.m., noon, 2 p.m., 4 p.m. and 6 p.m. Tuesday, Dec. 12. Due to a contractual agreement, please call or go online for the movie title. One-on-one technology help is available during computer clinic at 10 a.m. Wednesday, Dec. 13, and 4 p.m. Wednesday, Dec. 27. Make and take snowman book art at 1 p.m. Thursday, Dec. 14. You will need to register for this event. The amateur photography contest ends at 6 p.m. Friday, Dec. 15. Board game club meets at 10 a.m. Saturday, Dec. 16. Come to the YMCA at 2 p.m. Tuesday, Dec. 19, for “Let’s Talk about It Tuesdays” to discuss “The Food Babe Way” by Vani Hari. Hooked on crochet meets at 6 p.m. Tuesday, Dec. 19. The Warsaw Artists Forum meets at 6:30 p.m. Tuesday, Dec. 19. After school maker club, for ages 13 to 17, meets at 3:30 p.m. Wednesday, Dec. 20. Scrabble club meets at 11:30 a.m. Thursday, Dec. 21. Teen Minecraft Club meets at 4 p.m. Thursday, Nov. 28.